charity, humanity, love and union with God. The Mevlana Museum houses his tomb, a collection of precious manuscripts, antique carpets, musical instruments and garments. 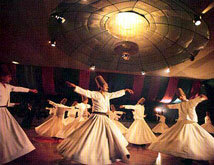 It also includes the dervishes lodges.